When you're running a busy practice, you need software that can streamline your workflow and help you get your tasks done quickly. Practice Master matches patients in the system for you when they book online saving time in the practice. Emails are also matched to patients automatically giving you access to their accounts, notes and bookings etc while you work. Everything is linked and cross referenced behind the scenes for you. 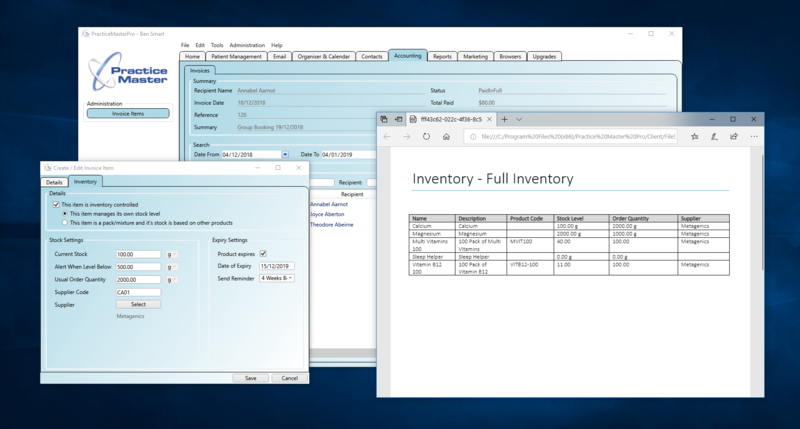 For example, you can access full patient functions while in the calendar or accounting screens, or you can access document generation or booking features while accessing patient notes. 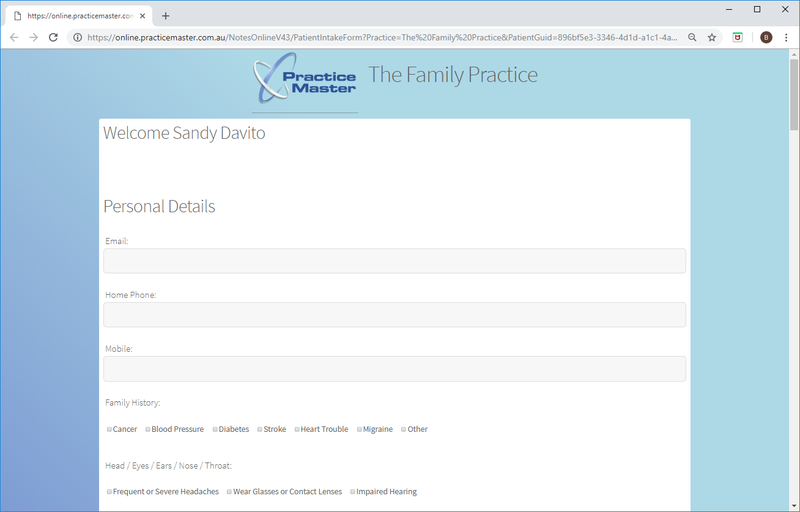 By using Practice Master Pro's hosted online booking system, you can offer your patients the ability to book online even if you do not have a website for your practice. If you do have a website then you can embed the calendar directly in to one of your own pages. 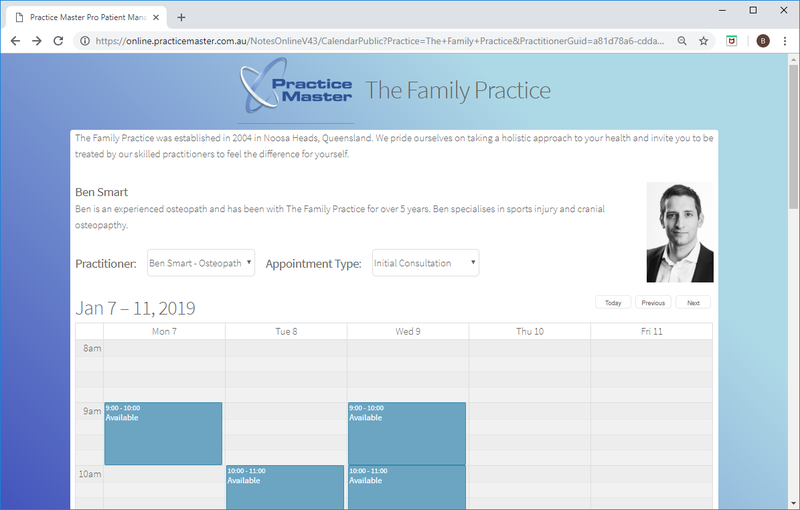 All bookings flow back in to your Practice Master Pro server and existing patients are automatically matched while new patients can be created with a single click. You can save a huge amount of time and overhead by letting your patients fill out an online intake form before their visit to the practice. 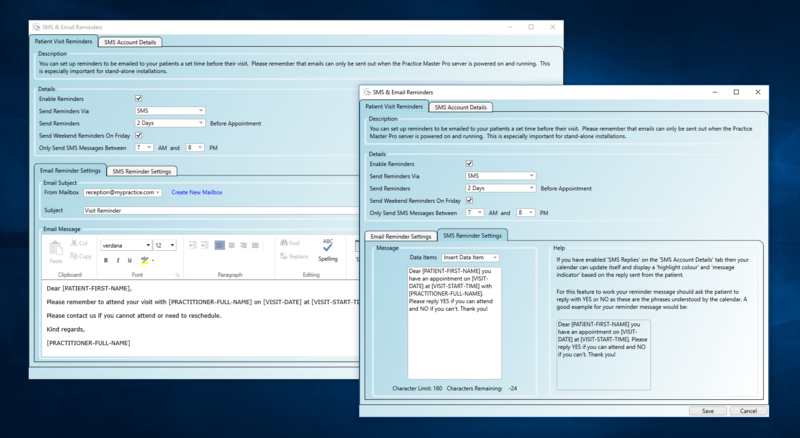 Your patients won't need to allow extra time for their first visit saving them time and removing the data entry workload from your reception staff. You can use the built-in form or customise using your own custom lists and multiple choice questions to cover everything you need. Their answers will flow back in to Practice Master automatically and will be available in their patient record and their patient notes for easy access. 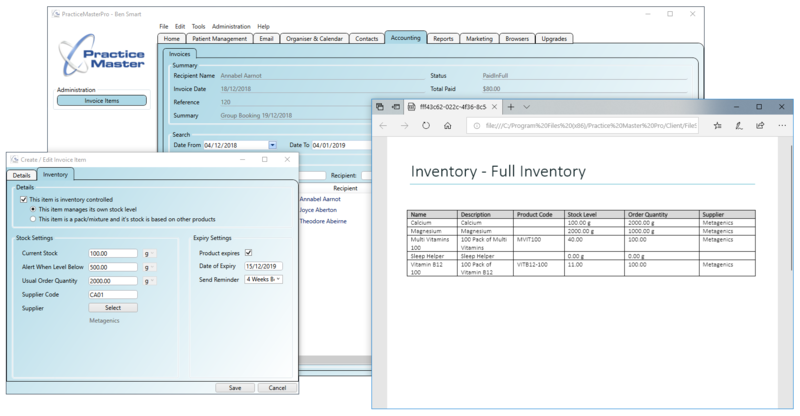 If you sell products from your practice then you need a robust inventory management system. Practice Master's built in stock level management can alert you when your stock goes below pre-defined levels to help reduce 'gaps' in your dispensary. You can use the expiration date monitor to alert you a pre-defined time before your stock expires to help reduce waste and ensure you have a smooth supply for your patients. The inventory system can extend to cover not just individual products but also composites, mixtures or packs you create yourself. We let you buy your SMS credits direct from the supplier so our SMS fees are one of the cheapest (if not the cheapest) in the market. They cost roughly half the price of our competitors and for a busy practice this can save you literally hundreds of dollars a year. If the patient replies with a 'YES' to confirm or a 'NO' to reject their SMS reminder then your calendar will be automatically updated so you can see at a glance the status of their bookings. We also have the option of email reminders which are completely free of charge to send. If your practice covers multiple physical locations, or even just multiple rooms at a single location, you can rest assured Practice Master can scale to your needs. 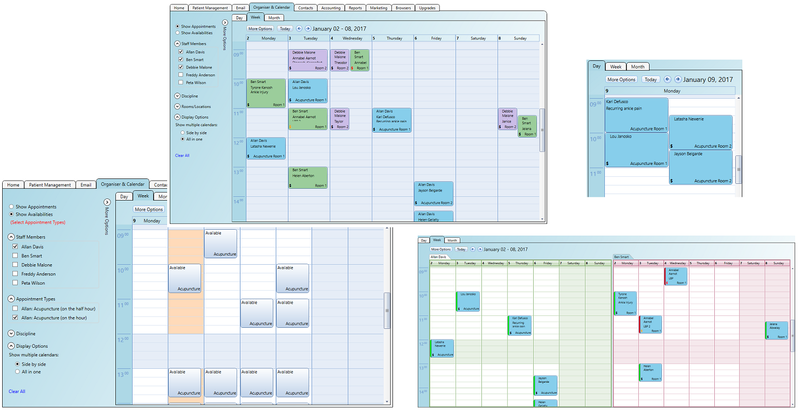 Rooms and locations also tie in seamlessly with online booking covering scenarios where your practitioners may work in several locations over different days in the week. The main calendar in Practice Master also makes it easy to view appointments or availabilities over multiple rooms, locations and practitioners all at once. 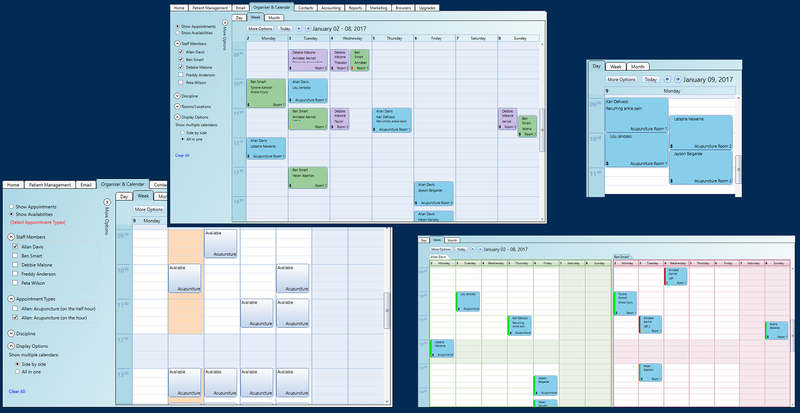 A functional responsive calendar can help your reception staff book and move appointments quickly. This gives your patients the best possible experience while in your practice. 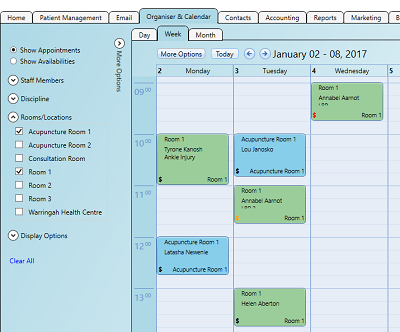 With Practice Master Pro's advanced calendar, you can view multiple practitioners calendars side-by-side, or you can combine in to a single colour coded calendar to easily spot vacant spaces. You can create 'Appointment Types' for each user which tie together things like name, duration, location, price, colour etc and can help your reception staff book and bill appointments for multiple practitioners without the need to remember or refer to a list of their specifics. Appointment types also allow the use of 'Availability View' in the calendar which shows only available slots for each appointment type selected. 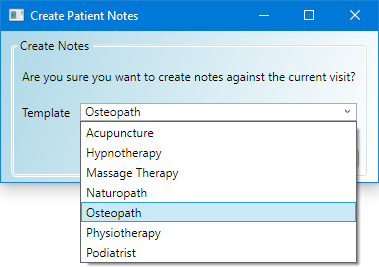 As the patient notes system uses templates (which you can customise or create yourself) you can use, for example, a Naturopath template as well as an Osteopath template in your patient notes. This means Osteopaths could work alongside Naturopaths in the same multidisciplinary practice using the same system. 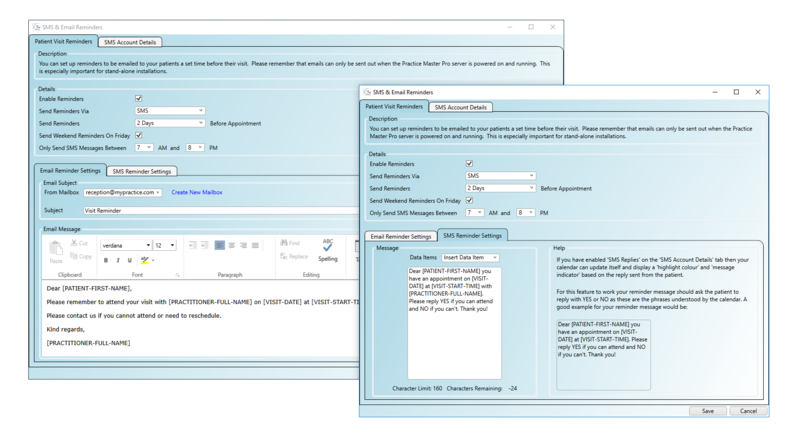 Of course, if you only practice one discipline you can still use the patient notes templates to create forms for different types of treatment, for example, an initial consultation or a follow-up as well as female/pregnancy/child templates. As every practice is different, we created a 'permission' based security system. 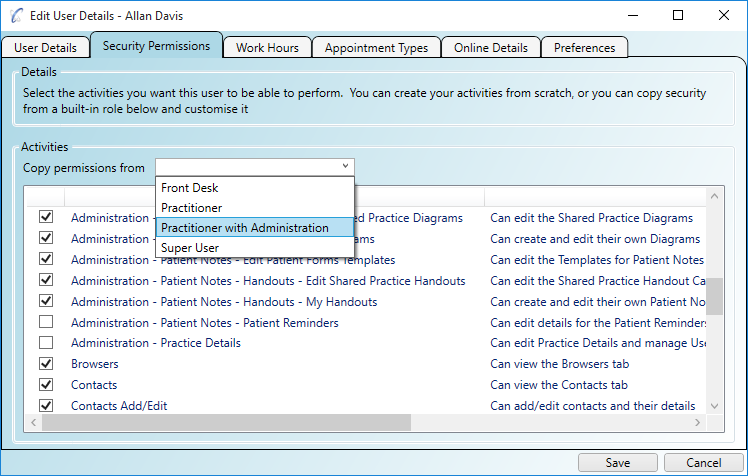 You can remove permissions for staff members on the front desk or add permissions to trusted practitioners. 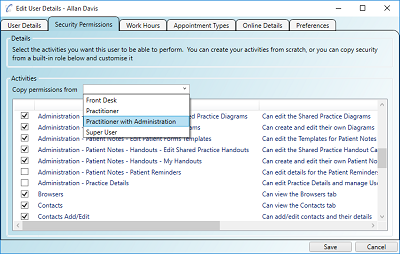 There are built-in suggested permissions sets for common practice roles which you can modify as needed per user. All identifying information and all files are fully encrypted in the database locally and online if you are using the cloud features. All data to and from the cloud is transmitted over a secure connection and all security and encryption uses industry standard methods and technologies. Practice Master has a direct integration with MailChimp which is a leading online email marketing tool. Practice Master sends your patient data to MailChimp where you can 'slice and dice' your data to target specific groups of patients directly in your email campaigns. Practice Master's custom patient fields, which you can create yourself in the application, also sync to MailChimp automatically. You can also use your custom fields to help target your specific patient groups for effective email marketing.